The Appearance Toolbar defaults to appearing at the top of the Main Window. If you don't see it, click the "Appearance Toolbar" option on the View menu. The Appearance Toolbar enables the display of calendars, events, notes, categories, priority types, and locations to be customized. The fill color, gradient pattern, and font may be modified to visually distinguish between these elements. The toolbar can also be used to assign background colors or images to dates selected in the Month view. The effect of changing an appearance from the Appearance Toolbar will depend on the "Color Events Using" selection on the View menu. For example, when coloring events based on category, selecting new colors from the Appearance Toolbar will update the selected category appearance. The Calendar Properties window can also be used to change the calendar appearance. The Appearance tab on the Event Editor and Note Editor windows can also be used to change an item's appearance. The Appearance Toolbar will be disabled when a task is selected, since task appearances are based on whether a task is overdue, completed, or upcoming. Task appearances can only be specified in the Task Calendar Properties window. 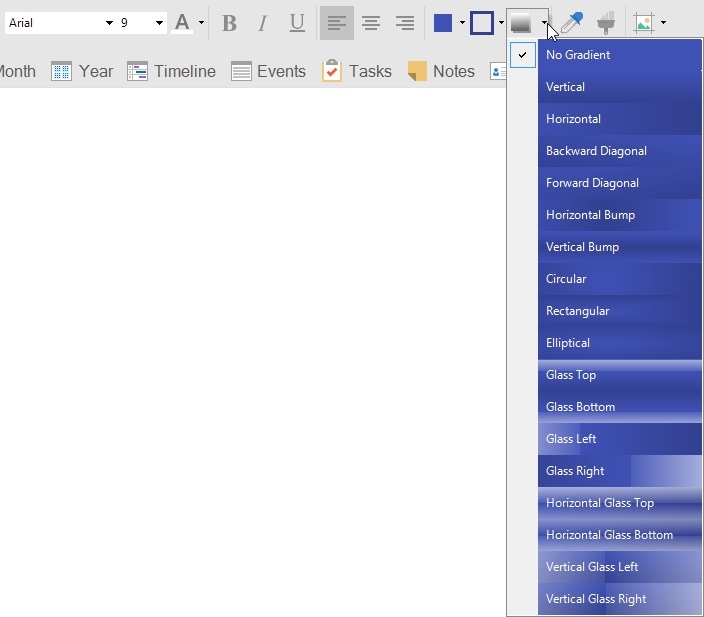 The Category Editor, Priority Editor, and Location Editor windows, accessed from the Tools menu, can be used to change appearances of the respective item types. You can also modify individual event appearances if the corresponding option has been enabled in the Appearance Options. By default, all events will share the same appearance, but this can be overridden. To change the appearance of an item, first select it. Calendars can be selected by clicking the calendar name in the Calendar List. Events and notes can be selected by clicking on them in the Calendar View. Categories, priorities, and locations can be selected from the respective tabs in the Calendar Items area of the main window. After a selection has been made, the associated appearance can be modified by adjusting the controls on the Appearance Toolbar. These controls are described in more detail below. Date backgrounds can be colors or images. The images can come from your local computer, network, or internet. A button is provided on the Appearance Toolbar for setting or clearing day backgrounds in the Month View. Backgrounds can be set to solid colors or images. The images can be selected from the local drive, network, or internet. For more information, see the Day Backgrounds topic. 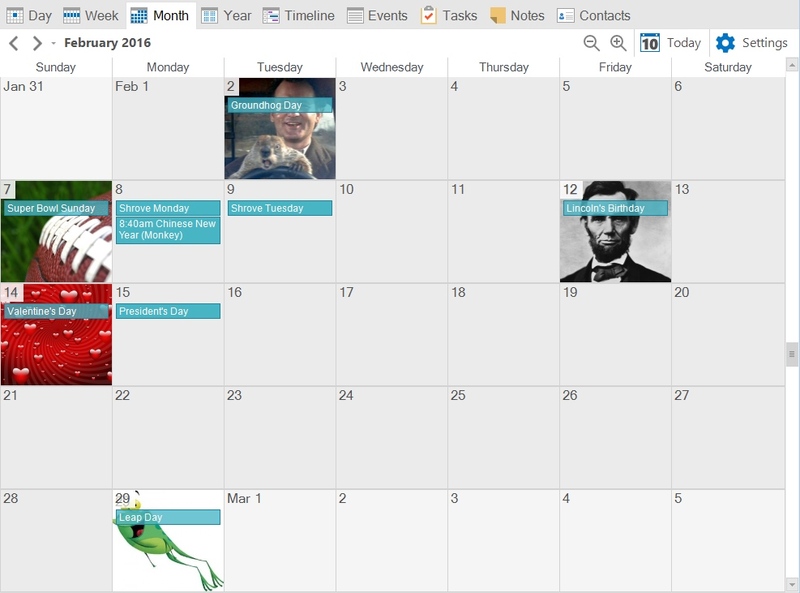 An example Month view, where several images have been set, is shown below. There are 114 distinctive pre-generated appearances. Each time a new calendar is created, its default appearance will be randomly assigned to one of the pre-generated appearances. The example below shows a few of the pre-generated appearances, which can be modified using the Appearance Toolbar. The font can be selected from a drop down list of all fonts that are installed on the system. The currently selected font will be at the top of the list. The font size can also be selected from a drop-down list. The available sizes range from 5 (very small) to 30 (very large). The font color can be selected from a drop down list of colors. If a custom color is desired, the "More Colors..." option can be selected from the list. This will cause a standard color dialog to be displayed where a custom color can be defined. The font bold style can be toggled by clicking the bold (B) button. The font italic style can be toggled by clicking the italic (I) button. The font underline style can be toggled by clicking the underline (U) button. Text content will be aligned to the left when this button is selected. Text content will be cenrtered when this button is selected. Text content will be aligned to the right when this button is selected. The primary background color can be specified using the drop-down. This color will be used in conjunction with the secondary background color and background gradient style to fill the event blocks that are shown in the Calendar View and Desktop Calendar. The secondary background color can be specified the drop-down. The selected color will also be used as the border color. A gradient style can be specified from the drop-down gradient list. The control shows the currently selected background colors, as well as the font options, to give a visual indication of what each gradient style will look like. Set the gradient style to "None" to have a solid background. Copies the appearance of the currently selected item. The selected item can be an event, note, calendar, category, priority, or location. After copying an appearance, the Paste Appearance button will update to show the primary color of the copied appearance. Pastes the appearance settings that were copied from another item by using the Copy Apperance button. The appearance will be pasted into the currently selected item (event, note, category, etc.). If multiple items are selected, them will all be updated with the pasted appearance. Background colors or images can be specified for dates selected in the Month view. Images can come from a local drive, network location, or the internet. When the Day Background button is clicked on the Appearance Toolbar, a menu of commands will appear for setting or clearing date backgrounds.